If you're in the UK at the moment you're probably avoiding cooking at all costs, am I right? We've got a teensy bit of a heatwave going on over here, to say the least, and we're all practically melting. 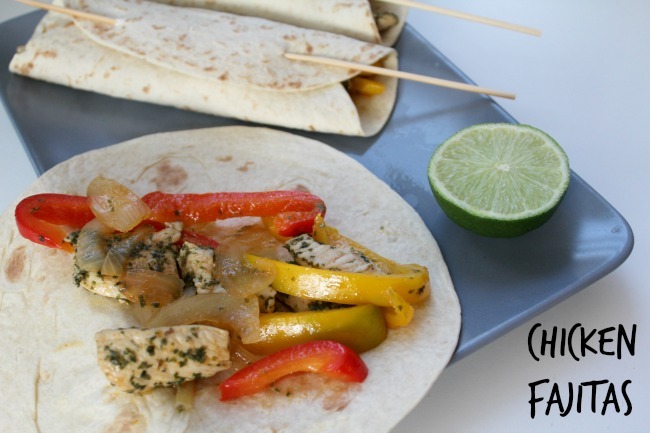 BUT, these fajitas are super easy to make, won't see you slaving over a hot oven for hours, and can be used as a serve-yourself meal. The latter is basically my excuse not to plate up anyone's food. Because y'know, why waste the energy in this heat? I've spoken about my utter love for South American food in both my review of Revolution Bar, Plymouth and Las Iguanas. Recently I decided to expand into making my own with these chicken fajitas and I'm not going to lie, I may be in love with them. They've become a weekly staple for me and my partner to make together, and the recipe has even made its way into my special recipe book, which is reserved for only my absolute favourites. If you're vegetarian, or even vegan, then it's totally doable with chicken 'style' quorn pieces, or even tofu. Plus, if you fancy something a little different, you could swap out the chicken for beef. - Cut the chicken, peppers and onion into long thin strips - Place the chicken and all of the seasoning for it into a bowl and mix until all of the chicken is covered - Leave the chicken to marinate for up to 1 hour. I usually leave it for 10-15 minutes. - Heat a frying pan with oil and cook the peppers and onions for five minutes. - Remove from the heat and place them on the plate. - Add another tablespoon of oil to the pan and cook the chicken until it is cooked through. - Add the peppers, onions and lime juice. Cook for 1 minutes and then serve. What is your go-to easy dinner to make in this heat? They're my favourite at the moment. let me know if you do - I'd love to hear how making them went! The heat has been nasty here in the U.S. too. Anything I can make outside, on the grill, is a go-to. I love anything spicy like this recipe (with more veggies for me!) or something fresh and cool like a salad (tomato and mozzarella anyone??) Hope you're staying cool! I can't even imagine how hot it is in the US right now! I'd love to have an outdoor grill, it would be a dream come true! Look so delicious, I want to try this now ! Thanks to sharing this recipe ! Love your blog ♥ Can we follow each other ? Let me know in comment and I will follow you back ! You're very welcome! If you make it send me some pictures - I'd love to see how it goes! June Favourites, A Life Update and VIDEO! What is living with your partner at uni like?